Hi, can i re-rig this animation and release it? Like ur anims. 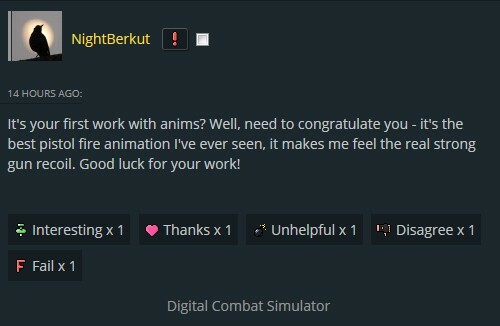 Hello there .. may i use your animations featured here in cs 1.6 ? So will you give me the clear premisson to use your Ak anims you didnt flag my skin or post in it and still got trashed..Yes or no i respect your call no matter what it is !! I'd like to know if I encounter any 1.6 skins that use a ported version of your anims, should I trash them or not? Hmm... interesting. Have you ever fired a real gun? If yes, then do you remember its recoil? That SIG P220 animation is much much better than quick pretentious anims appearing here very often. The biggest part of guns are spoiled by animations that make me feel like damn gangster. When pistol reload takes over a second, when you can fire few bullets in a second. Not interesting. Soldier,I tell you about something,The guy he didn't ask for you premisson to use your M16 animation for CS,I know you didn't want seen your ported anims seen in release,Maybe to try flagged it?